One of my first patterns on Moogly was the Chevron Lace Wrap – and I’m delighted to see that people are still making it! 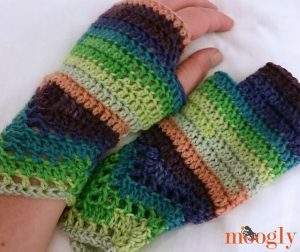 This pattern is made with DK weight yarn, for a slim and warm fit. I used a self striping sock yarn, Schachenmayr Regia Stripemania Color!